A shuffle conveyor transports carbon-steel scrap from one of the smaller presses operating at Canada Stampings (above) and deposits it onto an under-the-floor shuffle-conveyor system. Canada Stampings LTD, Woodstock, Ontario, a Tier II supplier to the automotive and aerospace industries as well as to the medical market the company has a rich heritage in the Canadian stamping industry. With its continued growth, the company, founded in 1898, has changed locations several times and upgraded equipment to meet market demands and opportunities. In 1997, company president Dave Hewitt purchased the company; in 2006 he built a new facility to handle all operations. Focused on continuous improvement and on developing quality-assurance programs, all operators are fully trained in statistical-process-control methods to ensure products are shipped on time and to specifications. 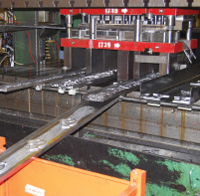 Canada Stampings operates seven mechanical presses that range to 600 tons, and offers secondary machining services when required as well as automated robotic welding, assembly and inspection. “Before moving equipment into the new building,” says Hewitt, “we analyzed all aspects of the operation with the major objectives being to increase efficiencies, reduce changeover times, improve plant cleanliness and install state-of-the-art equipment wherever possible. We achieved all of those objectives, but one major improvement that needed additional attention was managing the scrap coming off our presses. When scrap reaches the end of the under-the-floor shuffle conveyor, it feeds to a steel-belt conveyor that takes it to the load-out area. 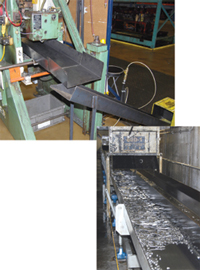 To upgrade its scrap-handling operations, the firm researched various options and settled on a shuffle conveyor system (supplied by Press Room Techniques, Inc., now part of Mayfran International, Cleveland, OH). Stamped parts exit a press at Canada Stampings on a series of shuffle conveyors and drop into a parts tote. The heart of the scrap handling system is the in-ground shuffle conveyor that handles carbon and stainless steels and keeps them separate using one conveyor tray with a center divider. On the floor above, each press sits over or next to the in-ground scrap-conveyor pit. A shuffle conveyor on each press removes scrap from under the dies, dropping it into a diverter chute that directs the scrap to the proper under-floor shuffle conveyor lane. A press operator typically controls this activity; on some presses, it’s done by the press control when the die number is entered into the control. When stamping nonferrous materials, the operator attaches auxiliary shuffle conveyor trays to divert the scrap to a bin next to the press, for manual dumping. The shuffle conveyors under the plant floor run the entire length of the stamping operations. When the scrap reaches the end of the shuffle conveyor, it dumps into a 42-in. dual-lane steel-belt conveyor (also from Mayfran), which elevates it up three stories. On top, each lane drops the scrap into standard steel hinge-belt conveyors, which drop the scrap into diverter chutes that feed into the proper roll-off bins. The roll-off bins sit on scales, which the Mayfran system monitors so when the bins reach the required load level, a swivel chute switches to the empty bin alongside the full unit. This optimizes efficiency for the truck companies that haul the scrap a. The shuffle conveyor employs extremely simple technology. An electric motor moves a driveshaft on an output hub through a reciprocating motion. As the driveshaft accelerates, the scrap on the conveyor tray pushes forward several inches, where it remains while the shaft returns to its original position, and then the cycle begins again. Thus, scrap shuffles its to its destination quickly and quietly. “We’ve yet to experience a single jam-up in the shuffle conveyors,” says Hewitt, who also notes how reliable the conveyor’s drives have proven to be. The motor and shuffle drives are direct drive—no belts or chains to break or maintain, and few of the wear-prone pinch points that characterize many conventional conveyor designs. Also, because the unit is non-vibratory, there is no risk of damaging the floor anchor system or the drive itself. In addition to having few moving parts, virtually all of the parts used in constructing the system are rated in excess of how the unit will actually perform. Article submitted by Mayfran Intl., Cleveland, OH: 440/461-4100; www.mayfran.com.